Here is a list I wrote to remind myself of the many modalities I can use in my class. Instructions: Just think back to your last week or two of teaching and check the boxes off. (To maximize this exercise, do it at regular intervals for several weeks.) Don’t expect to check all the boxes. This is a self-observation tool. The aim to help you become aware of the modalities you favor and the ones you avoid. The real work is in trying to switch things up and use one of the un-checked modalities on this list. Did the students . . .
1. look at illustrations or photographs? 2. look at charts, graphs, or maps? 4. read along as they listen to someone read aloud? 5. read aloud to others? 6. write in their notebooks? 7. write on the board? 8. trace words with their fingers? 10. practice pronunciation chorally with one ear plugged? 13. use movement or music to improve their intonation? 15. make their own flashcards? 16. highlight or underline words in a text? 17. write a vocabulary list? 18. listen to the audio? 19. listen to another student speaking English? 20. listen for specific features: stress, syllables, sounds, rhymes? 21. work in small groups? 23. work as a whole class on one question or assignment? 24. work on a computer? 25. use a dictionary or translating device? 26. use a cell phone to show pictures? 28. stand up in front of a group or the class? 29. mime the meaning of a word or phrase? 30. listen to relaxing music while doing individual work? 31. listen to the words in a song? Are there other modalities you use in your classroom that I didn’t list? Please share your ideas! A Multilevel Dictation for Low and Intermediate Levels created by John Antonellis. The teacher dictates key words one at a time. Students write the words and then check their work. The teacher dictates sentences with the key words. Students orally repeat the sentences and write the number of words they hear. Students write the sentence referring to the key word list as needed. This handout has been adpated to fit blog formatting. Part 1: Listen and write the word you hear. Part 2: Listen and write the sentences you hear. What better pursuit in summer than a little pleasure reading? This summer students in my multilevel class will explore some independent reading. I have a small library of readers from all sorts of presses. It represents a variety of texts –non-fiction and fiction with levels from emerging reader up to third grade level. These are small readers students can tuck into their bags and read on their commute. ease. To gauge the level appropriateness of a book, have the student read one page of text. If the student encounters more than five unknown words on the first page, it is too high for pleasure reading. Once a week, we gather around our trove of books and students point out the ones they recommend . . . or not. The objective is to engage students in talking about books. Then students select a book they want to read outside of class. When a student returns a book, s/he can choose another one. To bring this up to a notch, I’ve added an element I’ve learned from consumer websites such as Amazon or Netflix. 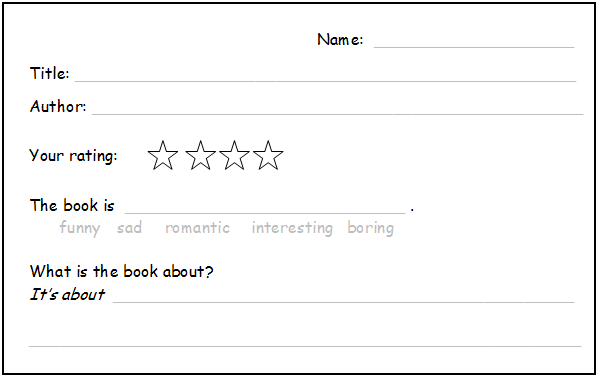 After each book, students write reviews, which I post on the classroom walls for their classmates to survey. Here is a sample. Flashcards are a great way to study new words, but students don’t always know how to use them. Here are classroom systems and activities I have used to get my students learning with flashcards. Cutting Expenses: File cards provide the sturdiest paper, but they can be pricey. My students cut 3×5 cards into quarters. Rainbow of Colors: Use a different colored card for each set of vocabulary. For example: green: household items; blue: clothing; white: verbs. Plastic Sandwich Bags: Students can carry all the cards they need in one little sandwich bag. In my class, students identify words they want to study. I write the words on the board and students copy all the words on cards: one word per card. Write a translation of the word. Write a sentence with the word. Draw an image to illustrate the word. Conjugate the verb or write it in a different tense or form (participles). Write other words in the word family: for example: Front side: class Backside: classroom, classmate. In pairs: Student A picks up a flashcard and asks “How do you spell [word on flashcard]?” Student B spells the word aloud. Then they switch roles. My students keep a piece of scrap-paper handy to write the word out as they spell it. Colors: students point to an object with the color. Verbs: student act out the verb action. Household items: student point to the item in a picture. Individually or in pairs, students alphabetize their cards. For this activity, one side of the flashcards must be blank. In pairs, students join their two sets of words and play concentration. Students lay all the cards face down. They take turns flipping over two cards at a time to find a matching pair of words. Writing: Individually students write sentences with the words. The teacher circulates to correct their sentences. Speaking: In pairs: Student A picks up a card and reads the word aloud. Student B uses the word in a sentence. Student A listens and takes dictation. The teacher circulates and checks the sentences students have composed. The possibilities are endless! Please share your ideas. In my low-level class I use sentence stems as a way to scaffold student writing. Recently we have been reading a very simple family drama and we have learned many words for feelings. Here are some of the sentence stems we have recently used. I feel great when _________________________ . I get frustrated when ___________________________ . I get upset when ____________________________ . I don’t like it when _____________________________ . I get confused when ___________________________ . I relax when _________________________________ . I feel stress when ______________________________ . I am thankful for _______________________ . I am proud of __________________________ . I worry about __________________________ . The standard approach to learning a new word is to define it, pronounce it, and then use it in a sentence, but words have many more dimensions. We remember words by context, by collocation, by sound, by spelling, even by movement (tracing the letters). I use the following list to remind myself of the many ways students can learn a new word. define What does it mean? listen How many syllables does it have? What does it rhyme with? pronounce Are there any tricky sounds? How does the mouth move when pronouncing the word? trace How do you draw the letters of the word? Can you write the word with your finger? spell What are the letters in the word? Does it follow any special spelling rules? visualize Close your eyes. How many letters does the word have?What’s the first letter? What’s the last letter? analyze What part of speech is it? Does it have a root word? personalize What does it mean to you? Can you describe someone you know with the word? categorize How is it different from similar words? Is it more formal or informal? Is it used for more for men or women? generate Write a sentence with it.Use it in a role-play. To sort students by level, give low-level and high-level students distinctly different types of cards (for example: a number card vs. a face card). To create same–level groups tell students to find someone with a similar card (for example: number card + number card). For mixed-level groups, have students find someone with a different card (for example: face card + number card). For large multi-level groups have students play “Black Jack” and find enough students to add up to 21. Students learn the terms for playing cards. It is not an obvious assignation of level. It works in a large class. There are myriad ways to mix and match.